I’m speaking at 3 different offline events on opposite ends of the US & doing 2 online LIVE training sessions all in the next 2 weeks. I know… I’m nuts! The good part is that I’m hooking you up to attend these live events with me. I’ll be Speaking LIVE on Sunday. You can get a “virtual” ticket to watch from home during the entire event & even get the recordings too! Also this weekend Friday 2/18-2/20: JValert LIVE! I would love to meet you live and in person at any of these events. I look forward to seeing you at at least one of them… even if it’s virtually! 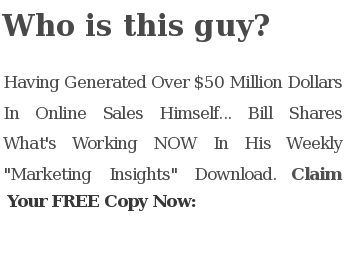 This entry was posted in Bill's Schedule and tagged bill-mcintosh, clickbank, clickbank masters, clickbank masters usa, internet business, internet marketing bootcamp, internet marketing coaching, jvalert, jvalertlive by Bill McIntosh. Bookmark the permalink.